Maytag MEDC400VW Super Capacity Electric Dryer - 7 Cu. Ft. 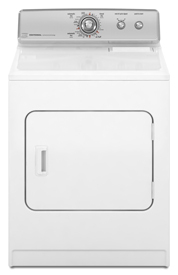 The super-size capacity of the MEDC400VW dryer from Maytag makes this machine a cut above the rest. Its GentleBreeze Drying System results in drier clothes, towels, linens, and bed clothes in a shorter period, without wearing or wrinkling them out. With its noise-free operation, drying clothes is much quieter and more convenient. This dryer is also manufactured using the standard commercial technology from Maytag, which means you are getting a dependable machine that can withstand some of the toughest loads. - The dryer comes in seven variable cycle options and 3 different temperature settings, so the appropriate setting can be chosen for each specific load. - The machine features the GentleBreeze Drying System that dries clothes, linens, and towels among others, gently but effectively. - The QuietSeries Sound Package results in a quiet, peaceful operation when drying. - The interior light feature results in better visibility while the dryer is being used. The bigger capacity of the MEDC400VW dryer from Maytag makes it an excellent machine for those who prefer a dryer that can efficiently dry more clothes in a lesser period of time. Most consumers also appreciate its reasonable price, making it one of the most affordable models among the rest of the dryers from Maytag. The machine also operates noiselessly, thanks to its Smooth Balance Suspension System, which include self-lubricating bearings that result in minimal vibration and quieter cycle. The dryer also comes with the DuraCushion Dryer Drum, which tumble-dries the clothes with lesser friction so that clothes are in no danger of snagging. The GentleBreeze Drying System dries the clothes consistently, so they come out fresh, crisp, and clean after loading. The dryer also has a reversible side swing door, high torque motor and, front and rear heat seal. There have been a few disadvantages associated with the MEDC400VW dryer from Maytag, and one of these is the placement of the lint remover, which is on top of the dryer. Lint removal results in a messy operation, since the feature is located on top of the machine. Also when used for longer periods, the dryer has the tendency to get too hot. It is also important to choose the right settings in order to dry the clothes completely as some settings do not result in completely dry clothes. Comments for Maytag MEDC400VW Super Capacity Electric Dryer - 7 Cu. Ft. This dryer didn't last much more than a year. No matter what heat setting we use, we have to run each load at least twice to dry clothes. I never overload the dryer, always remove lint between each load, and often check vent for build up. A big waste of money if you consider the purchase price and additional cost for electricity due to running dryer two or more times per load. The repairman we had look at it said with the cost of replacing the parts we needed it made more sense to purchase a new machine. I loved Maytag products but this one machine changed my mind. I do regret buying this model! I didn't know that having the lint trap on the top would be such a pain. Honestly, I read some other reviews before I bought this model and thought they were being a bit too picky but man, were they right! If I had my chance to do it all over again, I'd still buy the Maytag, same style, just get the more expensive model. For about $100.00 more, you get the lint trap in the door and more temp control. Other than that, it is a good dryer. We bought ours at Lowe's about 6 months ago and have not had any problems at all. Join in and write your own page! It's easy to do. How? Simply click here to return to Maytag clothes dryers.